40% of children younger than 3 have never been to the dentist. Taking your little one to the dentist puts your child on the right track for a strong and healthy smile. Babies should see the dentist within six months of their first tooth and no later than their first birthday, according to the American Academy of Pediatric Dentistry. This early visit sets the foundation for good oral health so your child can avoid problems such as cavities down the road. Only 60% of children playing fall and winter sports wear mouth guards. Popping in a mouth guard before hitting the field is one of the best ways to keep your teeth safe. Mouth guards are specifically designed to protect teeth from trauma and the jaw from fractures. They also help minimize lacerated and bruised lips and cheeks. All young athletes should wear properly fitted mouth guards when playing contact or collision sports like basketball, skiing, soccer and hockey. 3 out of 4 millennials only brush their teeth once a day. Brushing with fluoride toothpaste twice a day for two minutes is essential for preventing tooth decay and gum disease. If you brush only once a day, you expose your teeth to harmful bacteria for longer periods, increasing your risk of cavities. Plus, you don’t get the chance to remove plaque buildup, giving it a higher likelihood of turning into tartar. 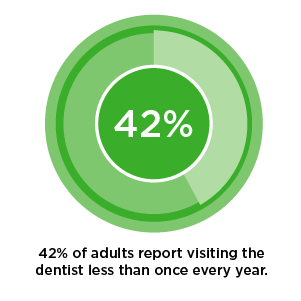 42% of adults report visiting the dentist less than once every year. Only your dentist or dental hygienist can remove tartar buildup. Because tartar causes cavities and gum disease, protecting your teeth and gums requires regular dental visits. Dentists also play a key role in preventing oral health issues or spotting them early so you avoid more complicated issues later.